How Should I Bathe My Poodle? What Happens if You Don’t Bathe a Dog Often Enough? When bathing your dog, there are a dozen different worries and thoughts you might have. Everything from basic questions about keeping the coat of your dog healthier, to more in-depth questions about sensitive skin and whitening shampoos are common when you begin to bathe your Poodle at home. Luckily, this article is going to cover some of the best shampoos for your Poodle, as well as how to avoid dry skin, products that will make bathing your Poodle easier, and a few other additions along with them. Depending on what issues your Poodle may have – whether an allergy to certain fragrances found in shampoos, to naturally dry skin, to simply having a love of rolling in smelly things – there is a shampoo that will work for you. The easiest way to sort the different kind of shampoos is to place them into four different categories: Whitening, Deep Cleaning, Hypoallergenic, and Specialty. In addition, there are also conditioners that can be added after shampoo to help your Poodle stay cleaner for longer. This article will show off the best option for each of these options, depending on your Poodle’s needs, as well as what to keep an eye for when picking a shampoo for your Poodle. The first shampoo on the list is the Wahl Color Bright Shampoo. This shampoo is produced by the same company that makes dog grooming tools. 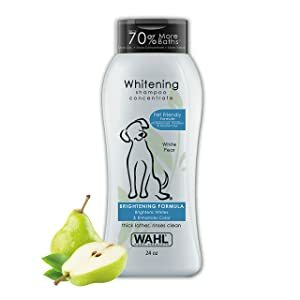 This shampoo is one of the best for washing Poodles who have that shiny white coat, and will make your Poodle look like they are ready for the local dog show. It is meant to be used along with the Wahl grooming tools, and is entirely derived from plant ingredients, preventing irritation in the Poodle’s skin. The JP Pet line is a top quality pet shampoo company that is sold online and in pet stores alike. This particular shampoo is one of the best when it comes to whitening and improving the color of light furred Poodles, but this shampoo also improves the coat of darker colored dogs. This shampoo is capable of making Poodles with darker coats lighten up a few shades, making it both suitable for light and darker colored dogs. This is not a permanent change, and will fade. Known mostly for their cleaning products, Nature’s Miracle is a company that excels at getting rid of any sort of dirt and grime in almost any circumstance. Their Odor Control shampoo works similarly to many of their other products, using cleaning enzymes to remove the dirt and bacteria that cause bad smells to linger. There is no better brand for getting to the root of bad smells, and they even have a formula specifically for getting rid of skunk smells from any surface, dogs included. Checking out their products for cleaning up messes left behind by a muddy or dirty dog can make cleaning up much easier. The Triple Strength Shampoo from Synergy Lab is a heavily concentrated shampoo designed for overwhelming the dirt and grime on your Poodle with a heavy dose of cleaners and soaps. It is pH sensitive, and made to not remove so much of the healthy oils in your dog’s coat that they are left with dry, itchy skin. The aloe and vitamin E also help provide support for some dogs who may already have dry coats, and if your Poodle lives in an arid or very cold climate, it is easy to end up with a few patches of drier skin. The first hypoallergenic shampoo is the Burt’s Bees Itch Soothing Shampoo. Just like the human products that Burt’s Bees produce, their dog shampoos are fantastic for more sensitive dogs or dogs that have skin allergies to other types of shampoos. 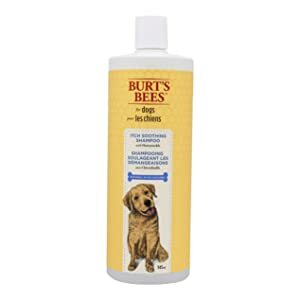 There are a few different kinds of Burt’s Bees shampoo, but the Itch Soothing shampoo is the best for making sure that your Poodle does not end up with dry, itchy skin, which can happen much more often in dogs than some people may think. The Espree shampoos are one of the best shampoos on the market, and you will see their products in professional grooming salons across the country. One of the biggest and best companies in both dog and cat grooming products, their Tea Tree and Aloe shampoo will soothe almost any dog’s coat and help with both dirt and dry skin. For Poodle who live in colder climates where dry skin is common, Poodles who have become matted and need to be soothed after being properly trimmed, and even just Poodles who are very sensitive to soaps, Espree is a fantastic choice. The Tropiclean shampoos are some of the best for anyone who wants a little bit more pop for their Poodle. 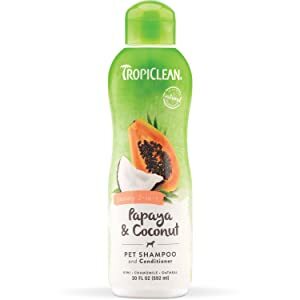 With a wide variety of different scents and shampoo choices, you can leave your Poodle smelling like anything from a field of berries, to papayas, and even kiwi blossoms. For Poodles that do not have any obvious allergies or sensitivities, these shampoos really give your Poodle some extra personality. You can also add in sprays and waterless shampoos to add keep your Poodle looking and smelling cleaner in between baths. The Oxymed shampoos are on the opposite end of the spectrum. These are medical grade shampoos meant for healing extremely dry skin, hot spots, and skin that had been damaged by fleas or ticks. 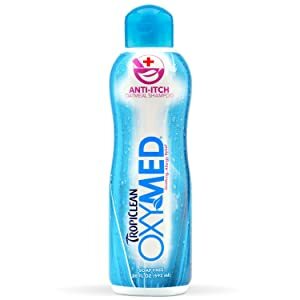 This shampoo line, especially the oatmeal medicated shampoo, is a great choice if you have just rescued a Poodle that might not have the best skin and coat, or one that was found with fleas and ticks on their body. They also carry a very effective anti-itch spray for dogs who have moderate hot spots on their bodies. From the same company who makes the excellent grooming brushes called Furminators comes a conditioner comes that helps coats that are ready to stay healthy after the groom. While Poodles are a breed that sheds very little, if at all, the Furminator Conditioner is fantastic for the regular brushing and work that a Poodle coat requires from their pet parents. Using the Furminator conditioner will give your Poodle a stronger, healthier coat, as it is made to keep the healthy, remaining fur on a dog stronger and less likely to be worn out and discarded. While it may be tempting to bathe your dog regularly, to keep them looking their cleanest and healthiest, this can actually be very detrimental to a Poodle. Their fur keeps in oils that their skin and coat healthy, and if those are constantly removed, their skin can become dried and cracked. If you still want to keep your Poodle looking clean between baths, consider conditioners or cleaning wipes for keeping clean. This is very similar to how our skin can dry and crack when exposed to elements or over-washed with harsh soaps. Many independent groomers in some areas will have Self Wash Stations, where pet parents can take their dogs in and use professional style baths. For larger brands of Poodles that require a lot of space for washing and cleaning, these can be a great option. Usually, they will charge a small fee for use, and shampoos are typically not included. If you do live near one of these self-wash locations, make sure to do research on what they provide and what they do not provide. They are a great resource for pet parents who simply do not have space at home to bathe their dogs. Besides just the normal issues of dirt and scent, a dog who is not bathed regularly can experience some severely detrimental health issues. Fleas and ticks love dogs who are not groomed and cleaned, as well are ear mites and other infestations. Yeast infections in ears can also occur. For their coat, mats can get so knotted and tight that it can actually pull and tear skin if they are not brushed and washed out regularly. In extreme cases, the Poodle may have to be completely shorn down. The other problem is what happens to the skin of a Poodle that is not properly groomed and washed. Patches referred to as Hot Spots can appear on the body. These are patches of itchy, raw skin that has been irritated and injured to the point that the skin becomes flushed and warmer to the touch. These spots itch and hurt the dog constantly, causing them to bite, scratch, and further injure themselves in an attempt to get relief from the irritation. If this occurs, certain remedies must be administered to the dog, including a full shave down to free the damaged skin, to vet care for infections or severe damage. These can happen especially to Poodles who get matted fur, as the pulling and pinching quickly irritates the skin under the matted fur. When bathing your Poodle, you may realize that they detest being in the shower or bathtub, and this can be a tricky situation. There are a few products you can purchase that will improve your Poodle’s bath time experience, and a few tricks to making them enjoy it more and more. A few products can be attached to the side of a shower for your Poodle to chew on or play with. Placing a toy into the shower, and letting your Poodle get it back out without the water turning on can also build a positive association with the shower, and starting this at a young age will help curb that fear early on. Conditioner, much like with human hair, is not a vital addition for most dogs. However, with thicker Poodle coats, a conditioning wash can be extremely helpful for keeping their coat from matting as easily. By adding extra sheen and volume to a Poodle’s coat, the fur will take longer to mat in between brushes, allowing for an easier time dealing with matted or tangled fur. The conditioners mentioned in this articles are.some of the best when it comes to your Poodle looking their sharpest. In short, the answer is no. Human shampoo is typically not made for animal use, and more and more are not tested on animals. Using human shampoo on dogs can cause severe reactions, and many essential oils that have positive benefits for people can be poisonous to dogs. One of the few products that can be used sparing on animals is basic Dawn dish soap, and it is used for smaller, younger animals who can be washed almost entirely by hand. It is typically recommended to use dog shampoo rather than Dawn when washing older dogs. When bathing your Poodle, remember that you want it to be a positive experience for both you and your Poodle. Taking slow steps towards acclimating a nervous Poodle towards the bath is important, and remember never to rush or force your dog into something that they show fear towards. Starting at a young age is always a good idea, and even older Poodles can learn a few new tricks when it comes to getting a bath.